Ages 5 through 11. Introduce your students to American Sign Language in meaningful contexts with these fun pictures, stories, and activities. 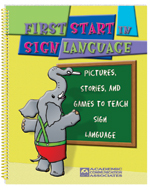 First, students learn to sign words for people, animals, objects and actions. Then they learn to produce simple sentences and to sign stories. Reproducible activity pages are included. Sign the Word. Students practice signing words when presented with pictures showing each sign. Sign the Sentence. Students practice signing sentences when presented with pictures of the signs. Match the Word to the Sign. Students match a printed word with the appropriate sign. Finish the Sentence. Students find the missing word in an incomplete sentence and draw a line to the sign that completes the sentence. Correct the Sentence. Students correct errors in signs used within sentences. Sign the Story. Students sign the vocabulary for a simple story as it is read. Combine the Signs. Students create sentences by combining words from lists and producing the sentences in sign language.